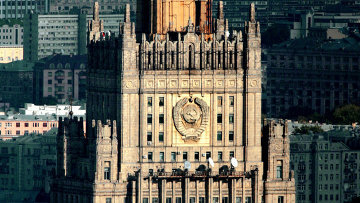 Foreign Ministry deems U.S. comments on NGO law gross interference | Russian Legal Information Agency (RAPSI). Tags: Legislation, Foreign Ministry, State Duma, Russia, U.S.
MOSCOW, July 13 - RAPSI. The statement made by the United States expressing concern for the recently passed law on non-profit organizations is a brazen attempt to interfere in the government's operation, Foreign Ministry Human Rights, Democracy and Rule of Law Envoy Konstantin Dolgov said on Friday. The State Duma passed in the third reading a bill on assigning a foreign agent status to nonprofit organizations financed from abroad and involved in politics at its meeting on Friday. The "foreign agents" will be entered into a special registry and different legal regulations will be applied to them, which will not affect ordinary non-profit organizations. The regulations will stipulate specific accountability and checks. 17:49 13/07/2012 The statement made by the United States expressing concern for the recently passed law on non-profit organizations is a brazen attempt to interfere in the government's operation, Foreign Ministry Human Rights, Democracy and Rule of Law Envoy Konstantin Dolgov said on Friday.